These Custom Imprinted Sampler Glasses may feature any design, message, and imprint colors you choose. We offer two different styles of 2 ounce Custom Sampler Glasses. Bars, restaurants, clubs, and many other organizations use our sampler glasses. 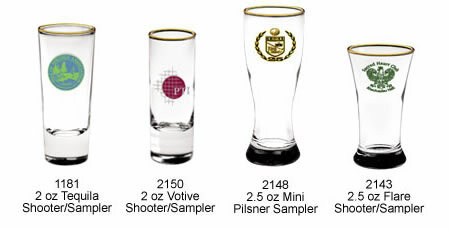 Pricing for Custom Sampler Glasses – Call 1-800-233-0828 for more info or to order! 1181 2 oz Tequila Shooter/Sampler 2.01 1.69 1.62 1.57 1.52 1.41 2-1/4" 1-5/8" 4-5/8"
2150 2 oz Votive Shooter/Sampler 1.70 1.40 1.34 1.30 1.26 1.18 2-1/4" 1-9/16" 4-5/8"
It's easy to have your own Custom Sampler Glasses. Simply call 1-800-233-0828 and submit your camera-ready artwork to graphics@kardwell.com (you can also mail or fax your art). The minimum order is just 72 Mixing Glasses. You will receive your Custom Mixing Glasses in about 3 to 4 weeks. Rush delivery is available.